BEFORE Game 2 of the Eastern Conference semifinals tipped-off Wednesday night at the United Center, Chicago Bulls guard Derrick Rose accepted the 2011 NBA MVP trophy from league commissioner David Stern. Rose, 22, is the youngest player to ever win the coveted award, unseating Wes Unseld, who was 23 when he was named MVP in 1969. Cheered on by a sold-out home crowd of over 22,000, Rose then went to work and proved why he is deserving of the Maurice Pdoloff trophy.The 6-foot-3 spitfire scored 25 points, 10 assists and six rebounds, leading his Bulls to an 86-73 triumph over the visiting Atlanta Hawks. Rose made only 10-of-27 shots and couldn't find his range beyond the arc, 1-for-8. But he was aggressive early and often, creating easy opportunities for himself and his teammates. Two nights after he didn't attempt a single free throw, Rose made 4-of-6 this time. Bothered by an errant ankle since the previous series against Indiana, Rose declared his ankle to be "fine" and that it had nothing to do with his less than stellar shooting saying it "wasn't a factor in the game," insisting that shots he normally make "just didn't fall tonight." Unlike their Game 1 loss, when they fell behind quickly at 9-0, the Bulls came out firing in Game 2 and took a 25-19 cushion after the first quarter. They padded their advantage to 48-37 at the half and built their largest lead of 14 -- 75-61 -- at the 6:54 mark of the fourth quarter. After surrendering a postseason high of 103 points in Game 1, the Bulls defense reverted back to its tough, stingy ways, holding the Hawks to just 26-of-77 from the field (33.8 percent) and 3-of-13 from 3-point range. Relying heavily on their size advantage, the Bulls effectively put the clamps on Joe Johnson, who was held to16 after exploding for 34 in Game 1. Jamal Crawford, who had 22 in Game1, didn't do well, either --- 11 points on 2-of-11 field goals. Despite its shooting woes, Atlanta made it interesting by creeping to within 77-71 off a 17-foot jumper by Jeff Teague with still 4:01 to go. But Chicago punched back with a 6-0 spurt to finally put it away. NOAH'S BARK. Joakim Noah, the Bulls' resident energizer, played like a man possesed. The 6-foot-11, 232-lb center-forward saw 39 minutes of action and made the most of it -- 19 points, 14 rebounds, three steals, two assists and a shotblock. Noah sank 6-of-8 shots and 7-of-8 free throws. And though saddled with five fouls and two turnovers, Noah was a whirlwind on both ends of the floor, particularly on defense where he guarded the paint with authority, hindering Hawks penetrations and altering enemy shots with his length and aggression. 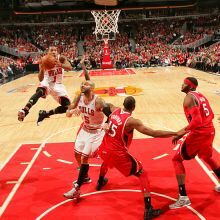 Luol Deng had another fine outing with 14 points and 12 rebounds while Carlos Boozer, the Bulls $80 million man, continued to fight through a painful turf toe and settled with eight points and 11 rebounds. The Bulls second stringers, which their fans fondly refer to as the bench mob, produced only 14 points. But it was enough to outplay their Atlanta counterparts, who coughed up 13. "We were our own worst enemy tonight," said Hawks coach Larry Drew, a former Laker who played in the NBA from 1980 to 1991. As he sifted through the debris of his team's dismal performance, Drew concluded that his Hawks "did a poor job" with their shot selection and that they "panicked" when their shots didn't fall.